Our space spent two months working incredibly diligently and collaboratively on a project we’ve called Tentris: Ten Foot Tall Tetris. This whole experience has been incredibly positive and has hammered home the value of good collaboration and the fun of a design thinking challenge. 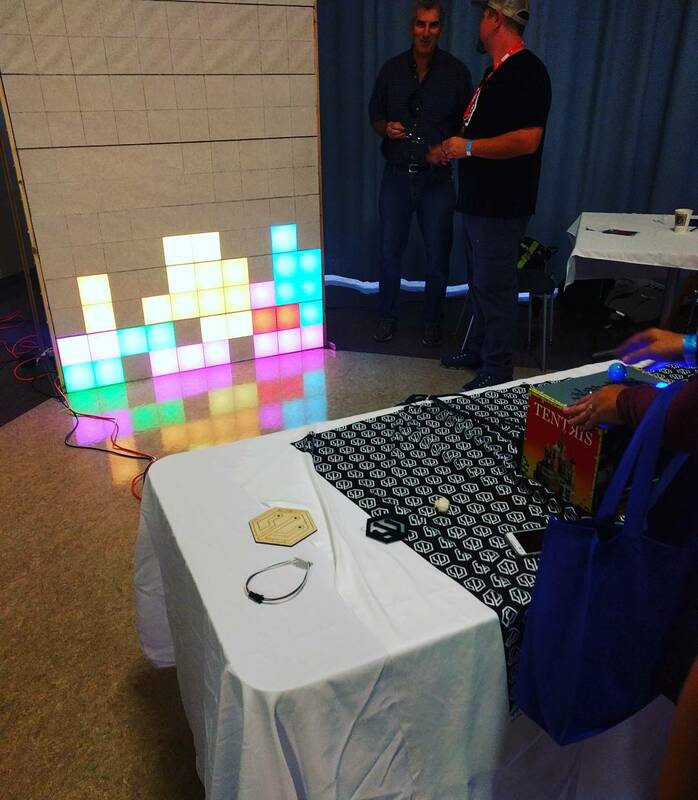 About a month ago, we were challenged to come up with an LED-focused exhibit for a local electronics show. I’ve totally realized at this point that I’m motivated by these constraint-based challenges. The introduction of this challenge luckily corresponded to an organizers meeting at MakerHQ and resulted in the planning of a space-wide endeavour to submit an exhibit. Coincidentally, Rocklin Mini Maker Faire would be happening the week before the exhibit and we’d be able to fill two events with one project! The planning sessions began with the first session solely focused on the ‘what’ we would build. This was a super casual event, there was beer being drank and many an idea thrown around. I still am in love with my original idea of a wall full of switches and a variety of outputs (think speakers, LEDs, rotating furbies). As a group, however, everyone was drawn to this idea of a massive game of Tetris made from individual LED cubes. A surprising lot was fleshed out that night, but I think we stuck to the idea of sleeping on it and ironing out some of the details in our period of letting the idea soak in. From there, the entire group put in work to design, build, and organize. Electronics, programming, fabrication, and assembly were all taken into account and we, as a group, tasked out what needed to be done. We worked towards a deadline of October 11th and were smoothly meeting all of our goals in good time. By Rocklin Mini Maker Faire, we knew we were in the clear and this was going to be one of the best interactive exhibits. I’m beyond floored that we got to do this as a team and I really thank Mike, Bill, Cara, Sean, Larry, Jeff, and Aaron for all the work and incredible design to the whole experience. I really wish there were more opportunities to do design challenges, as it’s so much harder to give yourself the constraints with which to work on.